I would like to officially introduce the second addition to the CSK family, one of California's finest, Seat Coats. Sean has been in the fixed gear scene for a handful of years. I can recall seeing some of his first edits circulating and immediately picking up on his free flowing energy and enthusiasm for bikes. With his laid back style, Sean links tricks together with seemingly effortless motion. Also, he has one of the cleanest bars in the game, just saying. I don't actually remember when we met, New York BFF perhaps, but I do think that he might have started a rumor that I have a kid. Which isn't true. 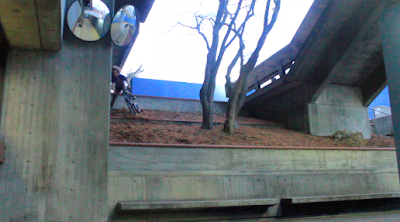 Sean just got back from a trip to the Bay Area and sent over a screen shot from an upcoming edit he is working on. Really excited to see what's in store. We sat down and wrote some questions for Sean and he later sat down and responded to them. Take a look and get to know him. CSK: Do you have a saying or motto that you live your life by? What motivates you to get up in the morning? To ride? I think just knowing that I'm still here and that it is the morning is good enough for me. To ride, it really doesn't take much. After being without a bike for so long, you realize that even having a bike in full working condition sitting beside you is enough of a motivation. How do you set your goals when it comes to bikes? I look at it more like I'm just trying to push myself constantly rather than set a bunch of specific goals. You have a 3-gallon jug, a 5-gallon jug, and an unlimited supply of water. How do you get exactly 4 gallons of water without estimating? What is your favorite part on your bike? What spot do you ride the most? What kind of set up is it? I ride the local college around the corner from my house. It's got eeeeeeverything.